For the area of London, see Westminster. Aside from a number of large parks and open spaces, the population density of the district is high. Many sites commonly associated with London are in the borough, including St. James's Palace, Buckingham Palace, the Palace of Westminster (Houses of Parliament) and 10 Downing Street. The borough is divided into a number of localities including the ancient political district of Westminster; the shopping areas around Oxford Street, Regent Street, Piccadilly and Bond Street; and the night-time entertainment district of Soho. Much of the borough is residential, and in 2008 it was estimated to have a population of 236,000. The local government body is Westminster City Council. A study in 2017 by Trust for London and The New Policy Institute found that Westminster has the third-highest pay inequality of the 32 London boroughs. It also has the second-least affordable private rent for low earners in London, behind only Kensington and Chelsea. The borough performs more positively on education, with 82% of adults and 69% of 19-year-olds having Level 3 qualifications. The current Westminster coat of arms were given to the city by an official grant on 2 September 1964. Westminster had other arms before, which had a chief identical to the chief in the present arms. The symbols in the lower two thirds of the shield stand for former municipalities now merged with the city, Paddington and St. Marylebone. The original arms had a portcullis as the main charge, which now forms the crest. The origins of the City of Westminster pre-date the Norman Conquest of England. In the mid-11th century, King Edward the Confessor began the construction of an abbey at Westminster, only the foundations of which survive today. Between the abbey and the river he built a palace, thereby guaranteeing that the seat of Government would be fixed at Westminster, and inevitably drawing power and wealth west out of the old City of London. For centuries Westminster and the City of London were geographically quite distinct. It was not until the sixteenth century that houses began to be built over the adjoining fields, eventually absorbing nearby villages such as Marylebone and Kensington, and gradually creating the vast Greater London that exists today. Henry VIII's dissolution of the monasteries abolished the abbey at Westminster, although the former abbey church is still called Westminster Abbey. The church was briefly the cathedral of the Diocese of Westminster created from part of the Diocese of London in 1540, by letters patent which also granted city status to Westminster, a status retained after the diocese was abolished in 1550. The Westminster Court of Burgesses was formed in 1585 to govern the Westminster area, previously under the Abbey's control. The City and Liberties of Westminster were further defined by Letters Patent in 1604, and the court of burgesses and liberty continued in existence until 1900, and the creation of the Metropolitan Borough of Westminster. 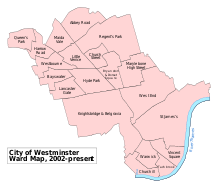 The present-day City of Westminster as an administrative entity with its present boundaries dates from 1965, when the City of Westminster was created from the former area of three metropolitan boroughs: St Marylebone, Paddington, and the smaller Metropolitan Borough of Westminster, which included Soho, Mayfair, St. James's, Strand, Westminster, Pimlico, Belgravia, and Hyde Park. This restructuring took place under the London Government Act 1963, which significantly reduced the number of local government districts in London, resulting in local authorities responsible for larger geographical areas and greater populations. 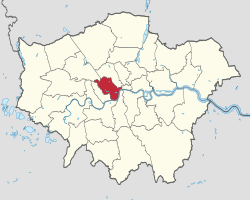 The Westminster Metropolitan Borough was itself the result of an administrative amalgamation which took place in 1900. Sir John Hunt O.B.E was the First Town Clerk of the City of Westminster, 1900–1928. Prior to 1900, the area occupied by what would become the Metropolitan Borough of Westminster had been administered by five separate local bodies: the Vestry of St George Hanover Square, the Vestry of St Martin in the Fields, Strand District Board of Works, Westminster District Board of Works and the Vestry of Westminster St James. The boundaries of the City of Westminster today, as well as those of the other London boroughs, have remained more or less unchanged since the Act of 1963. The following table shows the ethnic group of respondents in the 2001 and 2011 census in Westminster. The city is divided into 20 wards, each electing three councillors. Westminster City Council is currently composed of 41 Conservative Party members and 19 Labour Party members. A Lord Mayor is elected annually to serve as the official representative of the city for one year. See List of Lord Mayors of Westminster for a list of former Mayors (1900–1965) and Lord Mayors (1965 to date). BP has its global headquarters in St. James's, Westminster. Houlihan Lokey, the international investment bank, has its London offices at 83 Pall Mall, London, Westminster. Pearson PLC and subsidiary Penguin Group: headquartered in a facility in Westminster. Rio Tinto Group, a multinational Australian-British company, has its UK head office in Westminster. Economist Group, publisher of The Economist and other materials, is headquartered in Westminster. SABMiller has its head office in Westminster. British American Tobacco has its head office in the Globe House in the City of Westminster. Marks & Spencer has its head office in the Waterside House. Pret a Manger has its head office in Westminster. Rolls-Royce Group has its head office in Westminster. Global Infrastructure Partners has an office in Westminster. Google has an office in Westminster near Victoria Station. EasyGroup has its head office in Mayfair, City of Westminster. Gulf Oil International has its head office in the city. AstraZeneca has its head office in Westminster. Petrofac possesses an office on Jermyn Street, near Oxford Circus. Northrop Grumman has its UK offices in Clareville House. Korean Air has its European head office in the City of Westminster. Iraqi Airways has its London sales office in the IKB House in City of Westminster. The Hong Kong Economic and Trade Office, London is in Westminster. 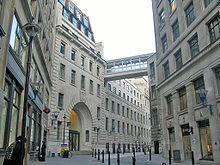 Companies that previously had their head offices in the City of Westminster include Imperial Chemical Industries (ICI), British Aircraft Corporation, British Midland (Portland House), British United Airways, British Mediterranean Airways, Cadbury, Diageo, BAA Limited, Lloyd International Airways, and P&O Princess Cruises. In addition, Iran Air previously had its Piccadilly main sales office in the city. The City of Westminster contains the some of the most famous sites in London, including Buckingham Palace, Westminster Abbey, the Palace of Westminster (Houses of Parliament) and Big Ben. These include Green Park, Hyde Park, Kensington Gardens, Regent's Park and St. James's Park. In addition to parks and open spaces within the borough, the City owns and maintains East Finchley Cemetery and crematorium in the London Borough of Barnet. 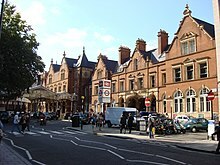 Stations include: London Charing Cross serving the South Eastern Main Line via southeast London and Kent; London Marylebone serving the Chiltern Main Line via northwest London, the West Midlands and Birmingham; London Paddington serving the Great Western Main Line via southwest England, Wales and Heathrow Airport; London Victoria serving the Brighton Main Line and the Chatham Main Line. The City of Westminster is served by 27 London Underground stations and 10 lines. By 2009 Westminster City Council had electric vehicle charging points in 15 locations through the city (13 car parks and two on-street points). Users pay an annual fee to cover administration costs to register and use the points. By 2018 there were 60 electric vehicle charging locations. In March 2011, the main forms of transport that residents used to travel to work were: underground, metro, light rail, tram, 21.0% of all residents aged 16–74; on foot, 9.3%; bus, minibus or coach, 9.3%; driving a car or van, 6.0%; work mainly at or from home, 5.5%; bicycle, 3.1%; train, 3.0%. Westminster Children's Services administers many primary and secondary schools. In addition, there are several state-funded faith schools, primarily Church of England (CE), and Roman Catholic (RC), but Christian non-denominational (ND) schools are also in the borough, and there are several non-profit-making junior and senior independent schools. The University of Westminster has its three campuses in the borough; 309 Regent Street (with 4–12 / 16 Little Titchfield Street and 32 / 38 Wells Street buildings uniting under the same campus), 115 New Cavendish Street, and 25 Marylebone Road. The Strand campus of King's College London is located within the district. The London Business School, in Regent's Park. The London School of Economics, at Clare Market, near Aldwych. The Royal Academy of Music, on Marylebone Road. University of the Arts London has constituent colleges in Millbank (Chelsea College of Art and Design) and Oxford Street (London College of Fashion). The Courtauld Institute of Art, in Somerset House, Strand. Brigham Young University London Centre, on Palace Court. The northern half of Imperial College London's main South Kensington campus lies within the borough. City of Westminster College is a further education college with campuses on Paddington Green and at Queens Park. It also owns the Cockpit Theatre, which is used as a training and performance venue. Regent's College, whose campus is within the grounds of Regent's Park, which houses: European Business School London; Regent's American College London; Regent's Business School; School of Psychotherapy and Counselling; Webster Graduate School; Internexus, a provider of English language courses. Westminster Kingsway College is a further education college with centres in Soho and Victoria in Westminster. It also has centres in Camden. The London Library, an independent lending library, is at 14 St. James Square. The city operates two reference libraries; Westminster Reference Library and Marylebone Information Service. Westminster Reference Library holds several special collections: of which the Sherlock Holmes, Arts and Business collections are the most comprehensive. In addition to the collections in Westminster Reference Library the city has two specialist libraries: the Westminster Music Library, the largest music library in the UK and the Westminster Chinese Library in the Charing Cross Library. In terms of tenure, the borough ranks highest on one standard criteria in analysing housing supply and demand, the proportion of private rented accommodation relative to other types of housing in England. This is indicative of a high density of development and higher investment demand relative to other districts in England and most of the 15 highest-ranking local authorities are boroughs of Greater London. Tourism also increases the proportion of willing third-party landlords, as the two authorities which are outside London in the list are England's largest south coast holiday resorts. ^ a b "Westminster (London)". Heraldry of the world. Retrieved 25 October 2015. ^ Coke, Edward; Hale, Matthew; Nottingham, Heneage Finch, Earl of; Francis Hargrave, Charles Butler (1853). "109b, Note (3) ". A commentary upon Littleton. The Institutes of the laws of England. 1 (1st American, from 19th London ed.). Philadelphia: R. H. Small. Vol. 1 p.164. Retrieved 17 May 2010. ; "December 1540; Grants, No.30". Letters and Papers, Foreign and Domestic, Henry VIII. British History Online. Volume 16: 1540–1541. London: Her Majesty's Stationery Office. 1898. pp. 174–175. Retrieved 5 June 2018. ^ "KS007 - Religion". Retrieved 30 January 2016. ^ "2011 census – theme tables". Retrieved 8 January 2016. ^ "Company Info." BAE Systems. Retrieved on 31 August 2011. "Registered office 6 Carlton Gardens, London, SW1Y 5AD, United Kingdom"
^ " London > BAE Systems plc." BAE Systems. Retrieved on 31 August 2011. "BAE Systems plc Address London – Stirling Square Carlton Gardens London SW1Y 5AD United Kingdom "
^ "Head Office." BAE Systems. Retrieved on 31 August 2011. "As you might expect, our London Head Office is the base for our Executive Board and for other senior group managers in strategic roles." and "Head Office is located in Central London but also has a number of support functions and functional specialists based in Farnborough, Hampshire." ^ ". "Anglo American Plc. Retrieved on 1 January 2017. "Registered office 20 Carlton House Terrace, London, SW1Y 5AN." ^ "Terms and Conditions." BBC. Retrieved on 6 January 2010. "British Broadcasting Corporation Broadcasting House, Portland Place, London, W1A 1AA." ^ "Contact BP in the United Kingdom Archived 25 May 2009 at the Wayback Machine." BP. Retrieved on 18 August 2009. ^ a b c d e f "Maps." City of Westminster. Retrieved on 21 March 2016. ^ "." BP. Retrieved on 22 December 2011. ^ "Investor Contacts Archived 16 March 2009 at the Wayback Machine." Pearson PLC. Retrieved on 28 August 2009. ^ "26. What is Penguin Books Limited's company registration number? Archived 11 July 2009 at the Wayback Machine." Penguin Books. Retrieved on 28 August 2009. ^ "Contact Us Archived 28 March 2010 at the Wayback Machine." Rio Tinto Group. Retrieved on 9 April 2010. "Rio Tinto plc head office 2 Eastbourne Terrace London W2 6LG UK"
^ "Locations." Economist Group. Retrieved on 12 September 2009. "The Economist Group 25 St James's Street London, SW1A 1HG United Kingdom"
^ "Kingfisher Group." Kingfisher plc. Retrieved on 2 February 2011. "Corporate Responsibility Kingfisher plc 3 Sheldon Square Paddington London W2 6PX." ^ "United Kingdom Archived 7 May 2014 at the Wayback Machine." SABMiller. Retrieved on 20 October 2009. "SABMiller plc Head office One Stanhope Gate London W1K 1AF England"
^ "Contact us." British American Tobacco. Retrieved on 15 December 2009. ^ "Company > Contacts." Marks & Spencer. Retrieved on 21 June 2010. ^ "Contact Information JOHN SWIRE & SONS OFFICES." Swire Group. Retrieved on 12 September 2011. "John Swire & Sons Ltd. Swire House 59 Buckingham Gate London SW1E 6AJ England"
^ "Welcome to Pret." Pret a Manger. Retrieved on 27 February 2010. ^ "Rolls-Royce headquarters". Rolls-Royce Group plc. Retrieved 28 September 2010. ^ "Contact Us Archived 18 February 2010 at the Wayback Machine." Global Infrastructure Partners. Retrieved on 27 February 2010. ^ "Inside Google's London Belgrave House office". 4 February 2015. ISSN 0307-1235. Retrieved 18 January 2018. ^ "About Us." EasyGroup. Retrieved on 10 March 2010. ^ "Legal Notice." AstraZeneca. Retrieved on 12 March 2010. ^ "United Kingdom." AstraZeneca. Retrieved on 12 March 2010. ^ "Global Contacts." Informa. Retrieved on 4 February 2011. "Head Office Gubelstrasse 11 CH-6300 Zug Switzerland"
^ "Company Locations." Northrop Grumman. Retrieved on 6 September 2011. "Northrop Grumman Corporation United Kingdom Headquarters Clareville House Oxendon Street London SW1Y 4EL UK"
^ "Company Info / Contact Info." Korean Air. Retrieved on 30 August 2011. "Europe Headquarters 66/68 Piccadilly, London, W1J 0HJ, U.K"
^ "London Office." Iraqi Airways. Retrieved on 30 August 2011. "Sales Office in London Address: IKB House 230 Edgware Road London , W2 1DW"
^ "Contact Us." Hong Kong Economic and Trade Office, London. Retrieved on 21 January 2009. ^ Gardner, Charles. British Aircraft Corporation: A History. Batsford, 1981. 40. Retrieved from Google Books on 1 September 2011. "The London headquarters chosen for bac were at 100 Pall Mall – on the top floors of a new concrete box which had sprung up on the site of the old, historic (and bombed) Carlton Club. It was the view of bac that small London headquarters[...]"
^ "World Airline Directory." Flight International. 28 September 1967. 530. "Head Office: 78 Buckingham Gate, London SW1"
^ "World Airline Directory." Flight International. 28 September 1967. 530. "Head Office: Portland House, Stag Place, London SW1"
^ "World Airline Directory." Flight International. 29 March-4 April 1995. 62. "53 Mount Street, London W1Y 5RE, UK"
^ Muspratt, Caroline. "Cadbury swaps Mayfair for Uxbridge." The Daily Telegraph. 1 June 2007. Retrieved on 27 April 2010. ^ "Contact us." Diageo. Retrieved on 15 December 2009. "main content Diageo plc 8 Henrietta Place LONDON W1G ONB"
^ "BAA Offices – Location Maps." BAA Limited. 17 March 2006. Retrieved on 2 October 2010. "BAA plc Head Office, Victoria, London (121KB)." ^ "World Airline Directory." Flight International. 12 April 1962. 548. "Head Office: Princes House, 190/195 Piccadilly, London Wl." ^ "IranAir moves to new offices Archived 29 February 2012 at WebCite." Iran Air. Retrieved on 29 February 2012. "177–179 Hammersmith Road, London, W6 8BS"
^ "Ticket Payment Information Archived 1 March 2011 at the Wayback Machine." Iran Air. Retrieved on 29 February 2012. "Iran Air Sales Office, 73 Piccadilly, London W1J 8QX"
^ "City of Westminster: Additional on street charging points for electric vehicles". Archived from the original on 5 May 2009. Retrieved 4 April 2012. ^ "Electric Vehicles". Retrieved 22 December 2018. ^ "Libraries Archived 8 May 2009 at the Wayback Machine." City of Westminster. Retrieved on 21 January 2009. ^ "Visit." The London Library. Retrieved on 21 January 2009. ^ "Westminster Find a Library." City of Westminster. Retrieved on 25 September 2015. ^ "Westminster Reference Library." City of Westminster. Retrieved on 25 September 2015. ^ ";Westminster Music Library Archived 14 April 2009 at the Wayback Machine." City of Westminster. Retrieved on 21 January 2009. ^ "Westminster Chinese Library Archived 7 February 2009 at the Wayback Machine." City of Westminster. Retrieved on 21 January 2009. ^ "Charing Cross Library Archived 31 January 2009 at the Wayback Machine." City of Westminster. Retrieved on 21 January 2009. ^ "Church Street Library." City of Westminster. Retrieved on 21 January 2009. ^ "Maida Vale Library." City of Westminster. Retrieved on 21 January 2009. ^ "Marylebone Library." City of Westminster. Retrieved on 21 January 2009. ^ "Mayfair Library." City of Westminster. Retrieved on 21 January 2009. ^ "Paddington Library." City of Westminster. Retrieved on 21 January 2009. ^ "Pimlico Library." City of Westminster. Retrieved on 21 January 2009. ^ "Queen's Park Library." City of Westminster. Retrieved on 21 January 2009. ^ "St. John's Wood Library." City of Westminster. Retrieved on 21 January 2009. ^ "Victoria Library." City of Westminster. Retrieved on 21 January 2009. Wikimedia Commons has media related to City of Westminster.